Every student receives a in the inclusive range from to . Any less than is a failing grade. If the difference between the and the next multiple of is less than , round up to the next multiple of . If the value of is less than , no rounding occurs as the result will still be a failing grade. For example, will be rounded to but will not be rounded because the rounding would result in a number that is less than . Given the initial value of for each of Sam's students, write code to automate the rounding process. Complete the function gradingStudents in the editor below. It should return an integer array consisting of rounded grades. The first line contains a single integer, , the number of students. Each line of the subsequent lines contains a single integer, , denoting student 's grade. For each , print the rounded grade on a new line. Student received a , and the next multiple of from is . Since , the student's grade is rounded to . Student received a , and the next multiple of from is . 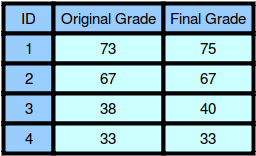 Since , the grade will not be modified and the student's final grade is . Student received a , and the next multiple of from is . Since , the student's grade will be rounded to . Student received a grade below , so the grade will not be modified and the student's final grade is .